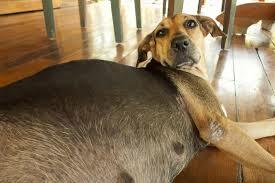 A dog is only pregnant for approximately 63 days so there isn't a lot of long term changes that will be required to properly feed and care for her. The first thirty days of her pregnancy, roughly to the halfway mark, is really business as usual. She will typically have some issues with what is the equivalent of morning sickness and she may go off her food for a few days at the end of the second week and perhaps into the third week of gestation. This is typically very temporary, perhaps two to three days and anything longer than that should be checked out by the vet. Always provide lots of fresh water for the mother to be all along in the pregnancy. Even if she is not eating during that morning sickness time she should be hydrating properly. If there are any signs that she is not drinking or appears in discomfort or anxious call the vet and get her in for a check-up. During the first half of the pregnancy, she can exercise as normal. She should go out on her daily walks as usual but don't introduce any new types of strenuous exercise. She can jog with you and play with other dogs as she always has. You may find she has slightly less energy than usual as she gets closer to the 30-35th day but she should not be lethargic or listless. It is important to continue to feed her high-quality dog food. There is no need to supplement the food with any vitamins or other additives and avoid feeding high calcium types of foods or supplements. There are risks associated with most vitamins and supplements, largely to the puppies, not the female herself, so never give a supplement at any time during the pregnancy unless you are working with your vet because of a known health problem or condition. The last 30 or so days of the pregnancy there are some important changes to consider. The first is to switch her feed over to high-quality puppy kibble. This should have a protein analysis of 28% to help the mother to stay in good physical shape for nursing the puppies. At this time the puppies are growing incredibly fast and they will be a significant drain on her metabolic system and she will need more food to stay in a healthy weight range. It is highly recommended that the female is isolated from other dogs for at least the last three weeks of pregnancy. She also won't need as much exercise and any strenuous exercise should be stopped. It is fine to take her for long walks in areas without other dogs or you can also walk her and play slow games of fetch in the back yard. She is likely not to be too energetic at this time and she will naturally slow down in her movements and actions. If you have other dogs in the house with the pregnant female make sure they are calm and not prone to boisterous behavior with her. While it is highly unlikely they will cause any harm to the female or unborn puppies it is always a good idea to keep her as calm as possible the last few weeks before whelping.